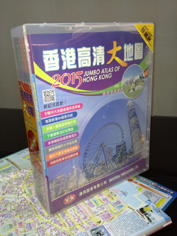 The Jumbo Atlas of Hong Kong is the first map guide in HK that allows the clearest reading of maps; it contains photos of all tourist spots of HK and more than 900 brief introductions sorted into 26 categories. It originates from the “Hong Kong Guide Book” which has been published for 40 consecutive years; because of the high demand for this kind of guide book, the Jumbo Atlas of Hong Kong was first published in 2011, and is greatly welcomed by the market. Now we are combining the first 2011 edition to the 2015 edition into a set of 5 books, contained inside a delicate Japanese transparent plastic box, for collection and daily practical use; it is truly the best chance to collect this fine map book series.